In the meantime, the sprinkler installers have been going full force. California requires sprinklers in any addition for sure, and by interpretation that may include any renovated areas. For my part, I am a big fan of fire sprinklers. Not only will they save your life, but they will save your house. If you have a fire, a sprinkler will put it out in one room with damage only to the area under the sprinkler that was triggered (probably, unless something super super bad happened). That's because sprinklers are triggered by heat only; chances are only one sprinkler will go off for a fire. With no sprinklers, the fire department will drench your entire house and ruin everything you own to put out a fire that is probably far larger and more damaging. So we are putting sprinklers in the entire house, and that takes some time. 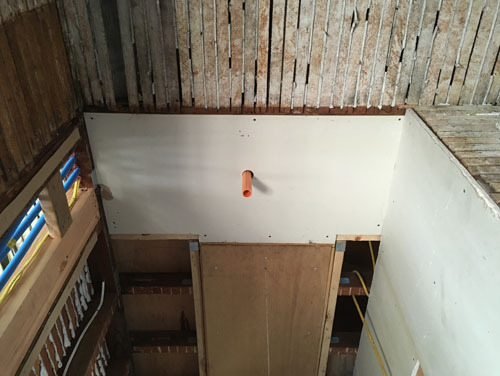 It also means, yes, MORE holes in the ceilings. We love holes in our ceilings. That's the front parlour ceiling. When I went by the house over the weekend, the sprinkler stub-outs were in place in the front of the upstairs, but nothing downstairs yet. This is what the stub-outs look like. This is a bit of the hallway between the front stairs and the new door to the addition. 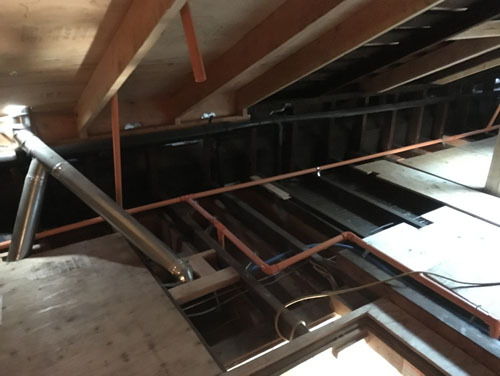 And here are the pipes in the attic. 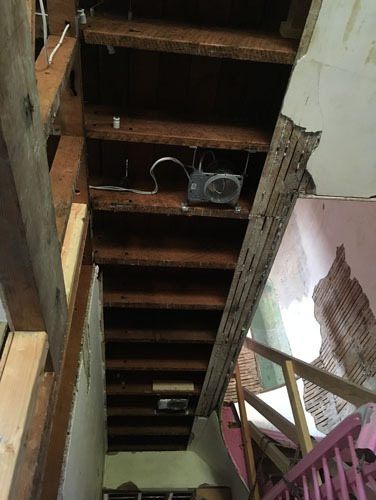 There are also sprinkler heads in the attic and basement, because those are places where fires can start. 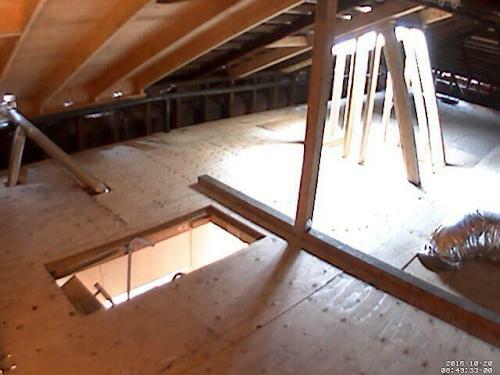 And in the attic the wide open space would be a disaster with an unchecked fire. OK, maybe not the most exciting video, but we'll take what we can get. 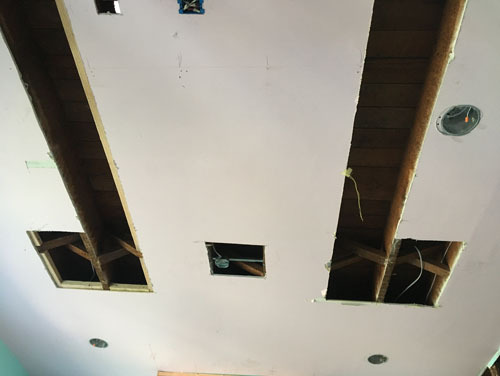 On a related note, the ceiling in the hall downstairs is now completely down, probably as some combination of the electricians and the sprinkler guys. That was pretty predictable. Noel was looking up there at his old nemesis, the knob and tube, pondering getting on a ladder and taking it out. 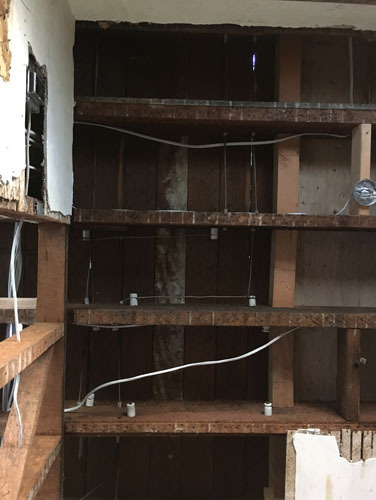 Will it happen before drywall is installed? What's he format of the attic video? My browser won't play it, says not supported. Thanks. It's MP4. Here's a direct link that may work (http://www.casadecrepit.com/images/attic-sprinklers.mp4). If it doesn't let me know and I'll put a copy on YouTube.